Before Shay became famous for vlogging about life with his boisterous brood of five, known on YouTube as the Shaytards, he was like many other American dads: He worked 9 to 5 to pay the bills, ate double bacon cheeseburgers during his lunch breaks, sipped soda throughout the day, and watched Netflix with handfuls of candy. These small behaviors added up, and before he turned 30, Shay was nearly 300 pounds. Motivated by the fear that he could have a heart attack before 35, Shay decided to make incremental changes to his eating habits and exercise regimen. Adopting the attitude that every action, no matter how small, was better than what he was doing before, Shay lost more than 100 pounds and ran four marathons, becoming a source of inspiration for everyone who followed his journey on his ShayLoss channel on YouTube. Now, at the age of 35, Shay has discovered that "maintaining" is the hard part. He has also seen how some of his hard-to-break habits are affecting his children, particularly his eldest son, Gavin, who grew up during the years when his dad had "a little extra Shay on him." Determined to get back into shape and inspire his son along the way, Shay asked Gavin to embark on a 30-day challenge with him to eat clean and do 30 minutes of exercise a day. 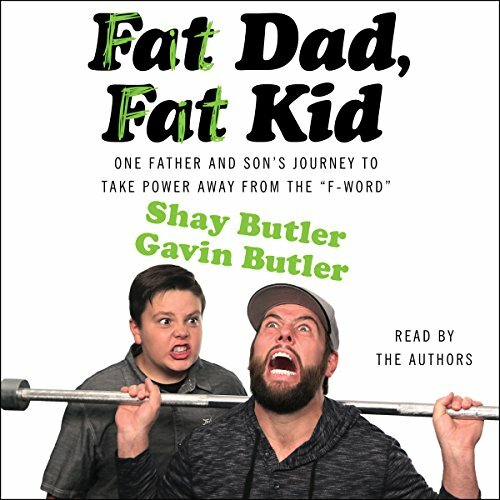 Full of Shay's signature blend of humor, honesty, and unbridled enthusiasm, Fat Dad, Fat Kid chronicles the ups and downs of Shay and Gavin's 30 days together, reflects on Shay's lifelong struggle with health and fitness, and proves that it's never too late for parents or children to embrace a healthier lifestyle - even when it doesn't come easily. As I sit here in my work truck as a 330lbs man after just finishing your book, I am more inspired and amped to change my life around and be healthy. I am going to share this amazing book with my family and friends. Thank you so much. I listened to it all in one day and thought that it was so good! Yay!! Going into this I thought I had already heard every bit of motivation I could hear from Shay, with being a long time viewer I've heard Shay preach many a time. But I still LOVED this book and felt motivated to make a change! New topics were brought up and older topics were delved into deeper. Great writing, while still sounding exactly like Shay. Loved hearing Gavin too, man I love that kid. So proud of you both!! Thank you for this! I recommend to everyone to go to the YouTube channel SHAYLOSS and follow along the 30 day challenge! I am the type of person who can not sit and read a book. I downloaded this book because I watch the SHAYTARDS on YouTube. I have cleaned my house and instead of playing music I listened to this book. It was very inspiring as I myself is struggling with weight loss. I never know where to start and after 3 days I'm done. I will be trying the raw fresh veggies and fruits, lots of water, and maybe just maybe no sugar as I know my family has to much. Thanks for a wonderful! What did you love best about Fat Dad, Fat Kid? I love the Shaytards, and I too have been the fat kid all of my life. Shay has inspired me a number of times throughout the last 7 years, including losing 70 lbs. of my own! I loved that He opens up about his struggles, his efforts and how he will NEVER give up! It gives me hope and inspires me to keep going! I also loved the snippets of Gavin's thoughts and stories! What a great kid! My favorite story is how he was inspired to write this book! What a fun story to be ordering cinnamon rolls and thinking I need to write this weight loss book! Which character – as performed by Shay Butler and Gavin Butler – was your favorite? Shays love for his kids! THE BEST! Congrats on this awesome book! such an amazing and inspiring book, I actually ended up finishing it all in one day. Shady and Gavin did a wonderful job with writing this book. It is amazing and will inspire And motivate others to reach their full potential. I've been a Shaytards fan for 6 years and I was very excited for this book. I'm an hour in and loving it. Great to hear from Gavin. What an amazing kid. His outlook is very inspiring and so wise for his age. Thanks for making this book! watching Shay for over 3 years now. He's truely a legend. I learnt alot from him. Definitely recommend this book to those who wants some positive changes in their lives. Thumbs up to you Shay. Have read it and then decided to get the audio book to since its voiced by them and I love their YouTube videos too. it was great to listen to and very motivational! Great job! Hearing these two father and son work together to better themselves gives great encouragement for me to look at myself and find my happy. I didn't read this for weight lose and found I can take their messages to help with a lot of areas in my life. Well done boys, you must be so proud as I know any one who reads this will be. This is an amazing book/audible. Love watching the ShayTards so a given to get this. It might help you to be better person it's All about doing right things in life what you want to do the most and always stay positive etc. I love this book ! It really gives you an insight to Shay and Gavin Butlers lives - taking power away from the 'F-Word' meaning fat. This book suits anybody from anywhere of any age! Fat Dad, Fat Kid was the first book I got on audible and I loved it!! Finished all 4+ hours in 3 nights and now I'm listening again 😏 I love the shaytards!! This book was entertaining, inspiring and just plain amazing. Well done Shay and Gavin on your achievements and hard work!